In The Zero Marginal Cost Society, Jeremy Rifkin argues that the capitalist era is slowly passing from the world's stage. The emerging Internet of Things is giving rise to a new economic system -- the Collaborative Commons -- that is transforming our way of life. In 2011, Jeremy Rifkin published the New York Times bestseller, The Third Industrial Revolution, which captured the attention of the world. His vision of a sustainable, post-carbon economic era has been endorsed by the European Union and the United Nations and embraced by world leaders including Chancellor Angela Merkel of Germany, President François Hollande of France, and Premier Li Keqiang of China. 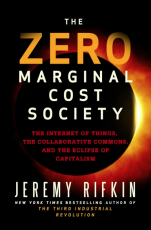 In his provocative new book, The Zero Marginal Cost Society, Rifkin explains how the Communications Internet, Energy Internet, and Logistics Internet are converging to create a global neural network, connecting every thing and everyone in an Internet of Things. This seamless, smart, twenty-first-century infrastructure is accelerating productivity and reducing the marginal cost of producing and distributing additional units of goods and services -- if fixed costs are not counted -- to nearly zero, making them essentially free. As a result, corporate profits are beginning to dry up, property rights are weakening, and the conventional notion of economic scarcity is giving way to the possibility of abundance as whole sectors of the economy are drawn into the zero marginal cost web. The wild card is ensuring data security and the protection of personal privacy in an open, transparent, and globally connected world. The plummeting of marginal costs is spawning a hybrid economy -- part capitalist market and part Collaborative Commons -- with far-reaching implications for society. Rifkin describes how hundreds of millions of people are already transferring parts of their economic lives to the global Collaborative Commons. "Prosumers" are making and sharing their own information, entertainment, green energy, and 3-D printed products at near zero marginal cost. They are also sharing cars, homes, clothes and other items via social media sites, rentals, redistribution clubs, and cooperatives at low or near zero marginal cost. Students are enrolling in free massive open online courses (MOOCs) that operate at near zero marginal cost. Social entrepreneurs are even bypassing the banking establishment and using crowdfunding to finance humane businesses as well as creating alternative currencies in the fledgling sharing economy. In this new world, social capital is as important as financial capital, access trumps ownership, sustainability supersedes consumerism, cooperation ousts competition, and "exchange value" in the capitalist marketplace is increasingly replaced by "sharable value" on the Collaborative Commons. Rifkin concludes that capitalism will be with us for the foreseeable future, albeit in an increasingly streamlined role, primarily as an aggregator of network services and solutions, allowing it to flourish as a powerful niche player in the coming era. However, it will no longer reign over the economy by the second half of the twenty-first century. We are, Rifkin says, entering a world beyond markets where we are learning how to live together in an increasingly interdependent global Collaborative Communications.